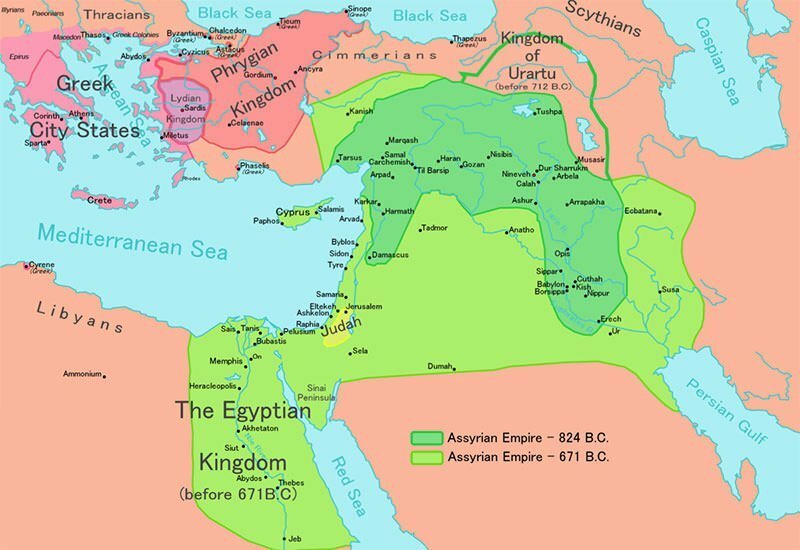 The Assyrian Empire was one of the major kingdoms in ancient Mesopotamia, which is a historical region situated between the rivers Tigris and Euphrates. Assyria was located in the northern part of Mesopotamia, roughly corresponding to present day northern Iraq, southeastern Turkey, northeastern Syria and northwestern Iran. The history of Assyria is usually divided into four periods: the Early Assyrian Period (2500 BC – 2025 BC), the Old Assyrian Empire (2025 BC – 1378 BC), the Middle Assyrian Empire (1392 BC – 934 BC) and the Neo-Assyrian Empire (911 BC – 609 BC). As it was constantly under threat from rival kingdoms due to its location, Assyria developed a powerful army which made it one of the first superpowers of the ancient world. The Neo-Assyrian Empire was the largest empire of the world up till that time and it became a model for future empires. Though most known for their ruthless war tactics, the Assyrians were also skilled artists, engineers and medicine men. 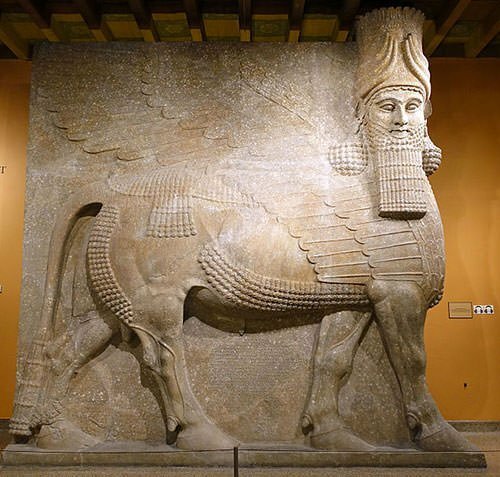 Know about the rise, history and fall; as well as important kings, art, engineering and achievements; of the ancient Assyrian Empire of Mesopotamia through these 10 interesting facts. Assyria gets its name from its first capital city Assur, or Ashur, located on a plateau above the Tigris River in Mesopotamia and today a region in Northern Iran. Ashur, in turn, gets its name from the deity Ashur, worshiped primarily in the northern half of Mesopotamia. The city dates from around mid-3rd millennium BC. Initially Assyrian cities and towns were probably ruled by Sumer, the first urban civilization in ancient Mesopotamia that had existed from 6th millennium BC. In 24th century BC, Sargon of Akkad conquered a large part of Mesopotamia to form the Akkadian Empire, which was the largest empire in recorded history up to that point and existed till 2154 BC. During this period, Assyrian rulers were subjects to Sargon of Akkad and his successors. The Akkadian Empire was followed by the Neo-Sumerian Empire (c. 2112 BC – c. 2004 BC) and most of Assyria was briefly controlled by it. 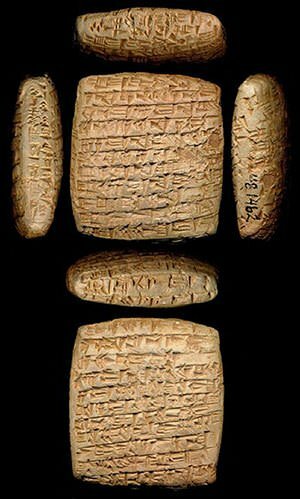 The Assyrian King List (AKL) is a list of rulers of ancient Assyria. Incomplete lists of Assyrian kings have been discovered in each of Assyria’s three capitals: Ashur, Dur Sharrukin and Nineveh. Tudiya, who ruled from around 2450 BC to 2400 BC, is the earliest Assyrian king named in the AKL. Earlier kings like Tudiya are recorded as “kings who lived in tents” and were perhaps independent semi-nomadic pastoral rulers. At some point they became fully urbanized and founded the city state of Ashur. Ushpia, who ruled from around 2050 BC to 2030 BC and is second last of the seventeen “kings who lived in tents”, founded the temple of Ashur in Assyria and is considered by some as the founder of the city-state of Ashur. Assyria reached its zenith during the Neo-Assyrian Empire which saw several powerful rulers including Adad-nirari II, Shalmaneser III, Tiglath Pileser III, Sargon II, Sennacherib and Ashurbanipal. After a period of subjugation to Akkadians and Sumerians, Assyria regained its independence in early 21st century BC. In the beginning of 2nd millennium BC, Ashur developed rapidly into a center for trade with its trade routes leading to the city of Anatolia (modern Turkey). Assyrian trade posts in Anatolia were known as karum (commercial district). The most prominent of these karums was established at the city of Kanesh and was hence known as Karum Kanesh. The wealth generated from trade in Karum Kanesh provided Assyrians with the stability and security necessary for the expansion of the city and laid the foundation for the rise of the empire. Also, trade with Anatolia provided the Assyrians with the raw material required for military weapons. Around 1700 BC, Assyria secured its borders on all sides and entered into a quiet and peaceful period in its history which lasted for two and a half centuries. Geography put Assyria in a vulnerable position with its terrain open to plunder from most sides. Due to this it was in constant threat from neighboring states including the Mitanni, Hittite and Babylonian empires. At different points in their history, the Assyrians were subjugated by these powers and they had to fight constantly for their independence. This created a reactionary effect in Assyria which led to it developing an effective, well organized and strong military system that could cope with the constant aggression, conflicts and raids by its neighbors. This ultimately made the Assyrian army into an extremely potent force and, by 8th century BC, they triumphed over most of the powerful Mesopotamian kingdoms to become one of the first superpowers of the ancient world. In 8th century BC, Assyrian general and governor of the city of Nimrud, Pulu, seized the throne in a coup during a civil war and killed the royal family. He assumed the throne name Tiglath-Pileser III and reigned from 745 BC to 727 BC. Tiglath-Pileser III is regarded as one of the greatest Assyrian kings. He implemented a series of sweeping reforms to reorganize the military and restructure the bureaucracy of the government. He divided provinces into smaller administrative units and appointed “sha reshe” or eunuchs as state-monitored governors of many of these units. He thus asserted central control over the empire providing it stability. 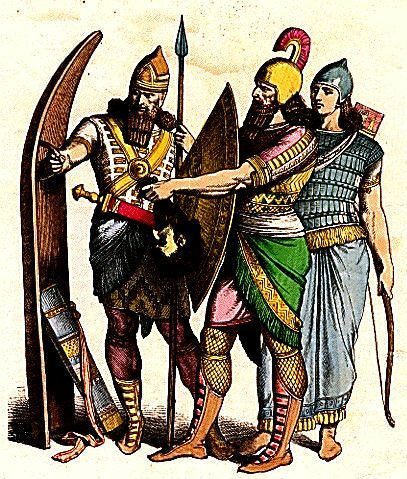 Tiglath-Pileser III created the first professional standing army of Assyria and made it into the most effective military force in history up until that time. His famed army would provide a model for future armies in organization, tactics, training and efficiency. Tiglath-Pileser III is considered one of the most successful military commanders in world history and he conquered most of the world known to the Assyrians before his death. Sargon II, a son of Tiglath-Pileser III, seized the throne from his brother in 722 BC and ruled Assyria till 705 BC. When he came to power, he faced widespread rebellions and external aggression but he handled these issues effectively to become one of the great rulers of Assyria. Under Sargon II, the Assyrian Empire reached its greatest heights. The Neo-Assyrian Empire was in fact the first truly modern empire in history which served as an example for future empires. It was the largest empire of the world up till that time extending to the Caucasus mountains and Black Sea in the north; encompassing Egypt, northern Nubia (modern Sudan), Libya and much of the Arabian peninsula in the south; extending into parts of Ancient Greece and the East Mediterranean in the west; and in the east, stretching into Persia, Media, Gutium, Parthia, Elam and Mannea (the modern western half of Iran). Ashurbanipal, who ruled from 668 BC to around 627 BC, is regarded as the last strong king of the Assyrian Empire. He was the most literate of the Assyrian rulers and is renowned for the vast library he collected at his palace at Nineveh. 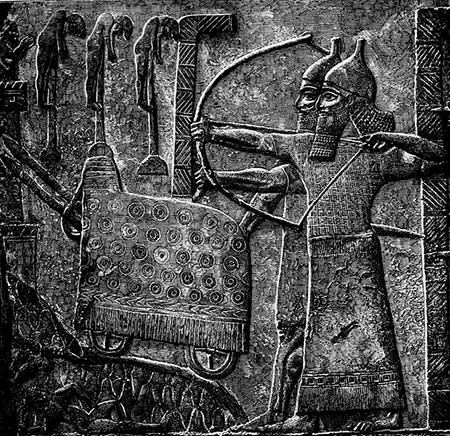 Ashurbanipal was also an able warrior and administrator. However, after his death, the empire began to disintegrate rapidly due to a number of civil wars involving a number of claimants to the throne. This drained Assyria’s resources and a coalition of the Medes, Persians, Babylonians and others destroyed the Assyrian capital Nineveh in 612 BC. A general called Ashur-uballit II was declared king of Assyria. He took assistance of Egypt but in 609 BC, the Babylonians and the Medes defeated the Assyrian-Egyptian alliance at the decisive battle at Harran. After this defeat, Assyria ceased to exist as an independent state. Ashur-uballit II proved to be the last king of the Assyrian Empire. 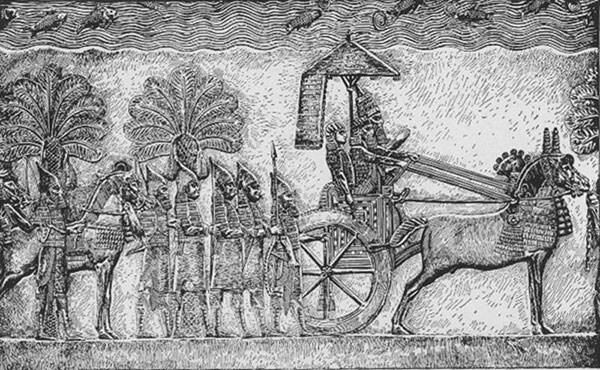 The Assyrians used a number of warfare tactics and military advancements to expand their empire. 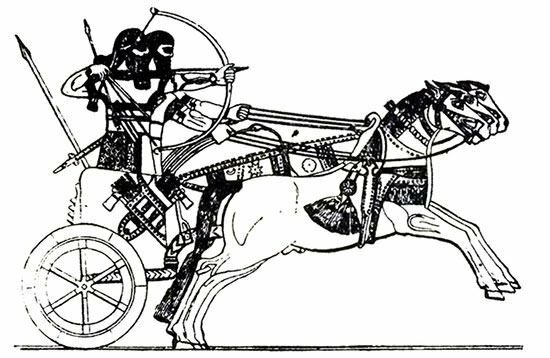 They used chariots which were drawn by four horses and mounted by four men as a shock weapon to charge into enemy ranks. The chariots were complemented by trained cavalry units. However, the bulk of the Assyrian army consisted of infantrymen, usually employed in specific tactical formations. They also employed siege warfare and used weapons like the battering ram. The Assyrians are known for terrorizing their enemies as part of psychological warfare. Their army is known for its utter ruthlessness and brutal treatment of enemies. Assyrians were also perhaps the first to use the practice of deportation on a large scale removing one enemy population and settling them into another. This not only helped them manage their subjects according to strategy but also terrorized their enemies and curbed nationalistic sentiment making rebellions less likely. Assyrian art reached its pinnacle during the Neo-Assyrian period when conquests of their great kings created the wealthiest state Mesopotamia had seen till then. 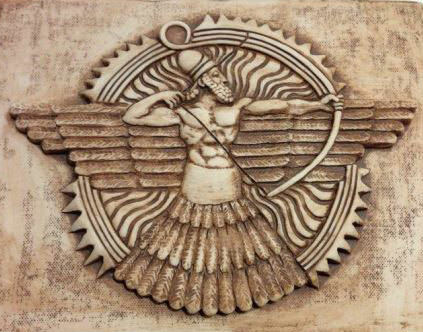 Assyrian art is primarily concerned with relief carving. Most of their best known works are huge lamassu guarding entrance ways; and palace reliefs. A lamassu is an Assyrian protective deity often depicted as having a human’s head; a body of an ox or a lion; and bird’s wings. Lamassu figures up to 5 meters high are the largest figures created by Assyrian artists and spectacular showpieces of their sculpture. The palace reliefs contain scenes which glorify the king, showing him at war, hunting, and fulfilling other roles. They also narrate triumphal scenes of sieges, battles and individual combat. The best known Assyrian reliefs include the renowned Lion Hunt of Ashurbanipal scenes from the North Palace of Nineveh; and the Lachish reliefs showing a war campaign in Palestine at the South-West Palace of Sennacherib in Nineveh. In medicine, the Assyrians are known to have kept detailed patient history records; use surgical procedures; and use crushed adaru-poplar seed (akin to aspirin) to treat patients suffering from headaches. Assyrians created an imperial communication network known as the “King’s Road” with a number of road stations. Their communication network relied on messengers mounted on mules. In 690 BC, the Assyrian king Sennacherib ordered the construction of a masonry dam to fulfill the requirement of water for his capital Nineveh. This masonry dam was constructed on the Atrush river and a 36 mile long canal provided water to the capital. It was a prodigious feat of hydraulic engineering for its time. The Royal Library of Ashurbanipal, named after the Assyrian king Ashurbanipal, contains 30,943 clay tablets including such renowned works as Epic of Gilgamesh. It was one of the largest libraries of the time and is one of the oldest ones to survive.